I have questions about obtaining soil samples and about the value of mushroom mulch. I would like to obtain soil samples from my large yard. How many samples should I obtain, what type of container should I use, where do I send the samples, how do I pay for the analysis, and what other information do I need? I have lost a lost of grass, both St. Augustine and Centipede. It was suggested that I have mushroom mulch spread on my yard. I have had a company both fertilizing and treating the yard for weeds. 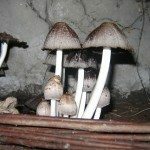 Is mushroom mulch a good product to use? What other approaches might be advisable? I think, for this much information, you will want to contact your local extension service. They will be able to help you will conducting soil samples, or guide you on how to do this yourself.